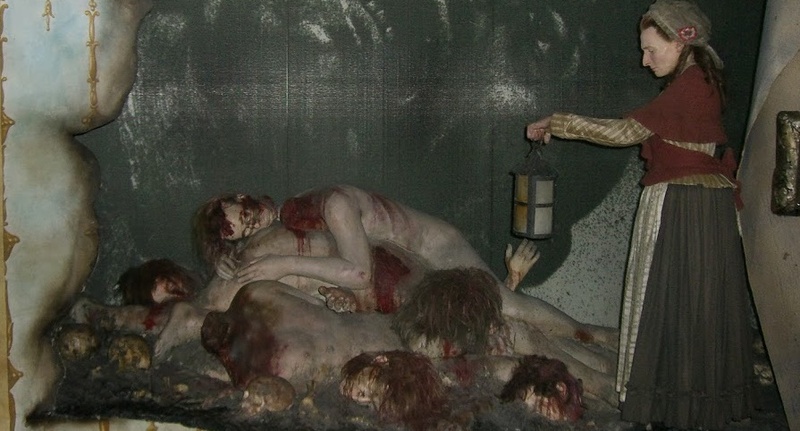 I was not going to write any more about Madame Tussaud and dead Revolutionaries, but in the end I've decided that the speculations surrounding David and the famous Tussaud waxwork of Marat in his bath deserve a post. 1. The Marat model is recorded as being in the possession of Madame Tussaud in 1803 and it may be safely assumed that the moulds for the head and shoulders were shipped with her to London in 1802. These same moulds have been used by the waxworks to cast the head and shoulders up to the present day though early 20th-century photographs suggest the bath has been replaced at least once. There are no surviving 19th-century photographs. 2. Reference to a full-length figure of Marat after his assassination (“Marat in the agonies of Death, immediately after receiving the fatal wound”) can be found as early as 1810 in a poster advertising the travelling Tussaud exhibition. 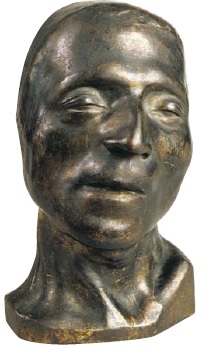 By 1820 the piece was displayed with the wax heads of Robespierre et al. in a separate room. It was now described as “Taken immediately after his assassination, by order of the National Assembly”. 3. According to David Bindman, “there is every reason to suppose” that the mould of the head and shoulders is genuinely contemporary with Marat's death, and that it was made for a commemorative display at Curtius’s waxworks. As Curtius was still alive at the time of Marat’s death, it is possible that he rather than his niece modelled the piece. The only documentary evidence for any direct link between David and the waxwork comes from Madame Tussaud's publicity material and her Memoirs of 1838. Smell a rat already? There are two claims, both pretty substantial. The first is that Madame Tussaud herself, under orders from David, cast the mould for the death mask of Marat. The second is that, following Marat's funeral, David used the Tussaud tableau as an model, perhaps even an inspiration, for the composition of his painting. In this version of events Tussaud's intervention is strictly clandestine: she is collected secretly by members of the guard who were acting on David's orders. The timing is superficially attractive. We know that the murder took place shortly after 7.30 on the night of the 13th July 1793. The body was transferred to the adjacent bedroom and an official certification of death issued shortly afterwards. The corpse was still in the rue des Cordeliers the next afternoon when the autopsy was carried out. And so we imagine the brave Marie roused from her bed and taken through the darkened streets by armed guard to undertake her macabre task. On the other hand, David was not even commissioned to create painting until the 14th, and why proceed in secret when he had official access to the body anyway? 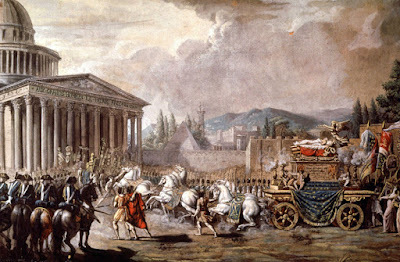 In real life the aftermath of the assassination was a highly charged affair, fraught with threats of crowd violence and complicated by the conflicting jurisdictions of the commune, the assembly and the Jacobin club - the guard answered to the section, not to an individual member of the Convention. An unaccompanied young woman was scarcely going to be able to enter Marat's apartment unnoticed and whip out the plaster of Paris! As noted previously, death masks are officially documented as having been taken by the sculptors Beauvallet and Deseine. Delécluze mentions a third in the possession of David (no wonder the body was in a poor state!). We don't know who created this latter, but there is really no reason to assume it was Curtius or Madame Tussaud rather than someone in David's own workshop. The surviving death masks of Marat don't provide much evidence one way or the other. There are examples in various French museums and collections, most of which look as if they came from the same mould. No-one seems sure where they originated. Some, including the one shown to Andrew Graham-Dixon at the Musée Grévin, are said to be by Madame Tussaud or copied from her original. However, the plaster mask from the Carnavalet, is listed simply as sculptor "unknown", provenance "unknown". The 2009 exhibition Marat contre Corday at Vizelle included a bronze mask (left) from the Musée Lambinet which looks slightly different and which Guillaume Mazeau identifies as by Deseine [Marat contre Corday, ill.2]. I am not at all certain from the pictures that the Tussaud Marat itself is based on a death mask - it could easily just be from a sculpted model. ... members of the Tussaud family, especially in days gone by, have produced subjects for other artists to paint from. For example, the model of Marat stabbed in his bath - which has been with our Exhibition ever since it existed in Paris - was modelled expressly to assist the famous David to paint his picture representing the death of the miscreant. This seems nonsense; the wax tableau was surely copied from, or at least modified in the light of, David's painting when it was on public exhibition in his workshop. However, the contrary view, has been surprisingly tenacious, perhaps because there is no evidence at all for the period when David was working on the painting. Wax models are known to have been used by Poussin. Helen Hinman, writing in 1965, speculated that Tussaud modeled a torso as well as the head and that "the creation of a waxwork display could be considered by David as an ideal opportunity to have himself provided with a full-scale, three-dimensional model." ("David and Madame Tussaud", La Gazette des Beaux-Arts, 66(1965) p.331-38). Was there really a working relationship between David and Curtius's workshop? Professor Pilbeam following the article by Hinman, examines the evidence. Wax effigies appeared in some of the funeral processions orchestrated by David. 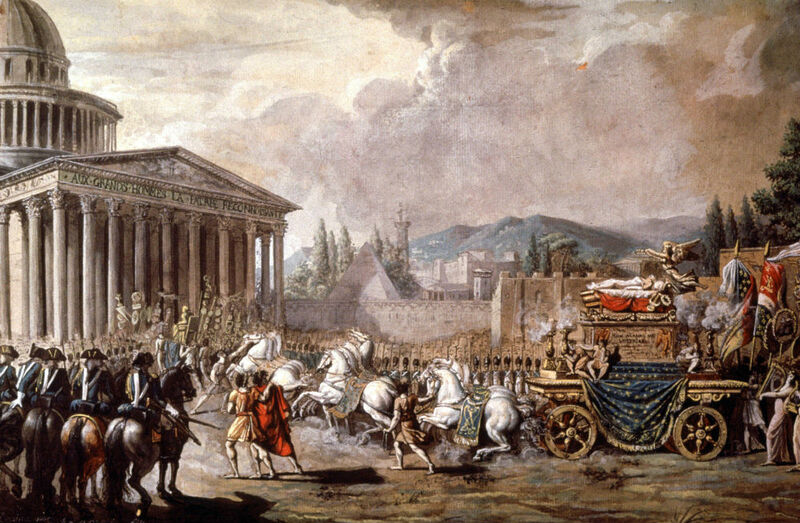 In July 1791 the wax image of Voltaire in the cortege which brought his body to the Pantheon was identified as by Curtius, or "in the manner of" Curtius. (Its red dye unfortunately ran in the rain). In April 1793, months before the death of Marat, a wax model by Curtius had also formed part of the huge funeral procession of the Polish patriot Lazowski [p.44-5]. Tellingly, though, there is no record of any participation in the funeral of Marat himself. The identification of Voltaire's effigy as the work of Curtius is also not conclusive; Antoine de Baecque in his book Glory and Terror: seven deaths under the Revolution (2002) argues that it was not a waxwork at all, but Voltaire's actual embalmed and mummified corpse. How plausible is the substantial claim that the public display of this tableau served as the principal reference for David's most famous painting? Some art historians have speculated that the links between the two works are more formal, and that David collaborated with Marie on the composition of her tableau, and instructed her on the exact pose of the body in the bath. Unquestionably the two works are remarkably similar. The art historian Roger Fry, writing on David's style, refers to "a highly polished Madame Tussaud surface", and there is indeed something waxy about Marat in this painting. In fact the perfect skin is but one aspect of this classically idealized representation of a youthful body that bore no relation to the putrefying green-tinged cadaver of the older Marat that was processed through Paris caked in white make-up in the elaborate funerary celebration orchestrated by David. But an alternative theory is that Curtius and Marie may have copied David's work, and that when his secular pietà was eventually hung in the court of the Louvre its impact was so great that they updated their own earlier Marat 'news story' to emulate his work. Later, in England, the Tussauds were open about copying work by David, specifically his Coronation of Napoleon, so this may have been an early example of this practice. Whatever, it is a fascinating chicken-and-egg conundrum...." Waxing mythical: the life and legend of Madame Tussaud (2006), p.149-50. Although Tussaud claims to have provided the model for David’s painting, (very likely the reverse was true), the two images represent entirely different viewing experiences. In David’s painting the powerful immediacy of the scene was used to transcend the limits of death, to bring Marat back ‘tout entier….’ The waxworks tableau to be found at Curtius’s Salon, by contrast, sought to make Marat’s assassination palpable for the viewer, not to transcend but rather to capture death. Palpable wounds were, by contrast, what Tussaud specialized in. The attraction of her waxworks depended on a kind of forensic gaze. David deploys a familiar aesthetics of martyrdom where the violated body is intended to move the viewer to the contemplation of immaterial values. Madame Tussaud’s Adjoining Room [later the Chamber of Horrors] instead concentrated on bringing death itself close, in all its abject details.…In the Chamber of the Dead, the illusion of life never brings the dead back to life. On the contrary, one could say of Madame Tussaud that she brings the dead back to death. Graybill, Lela. 'A Proximate Violence: Madame Tussaud's Chamber of Horrors'. Nineteenth-Century Art Worldwide 9.2 (2010). - All of which is a posh way of saying that David's Marat is a great work of art, whereas the Tussaud Marat is just a nasty waxworks horror.